When designing a garden the structural elements such as fences, arbors, walkways, paths, small buildings, sheds and walls create the framework for the garden. 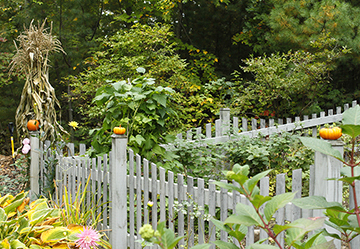 A wooden fence can be a wonderful backdrop for perennial beds in all four seasons. Here is an example of a late fall garden with seasonal decorations of corn stalks and pumpkins adding color and interest. This wooden fence was stained instead of painted to keep maintenance at a minimum.